During the raid of the house of Vanessa Monroy Gonzague - an educational engineer who took over Keleher & Associates in early 2017 - officers from the Office of the U.S. Inspector General and the Federal Bureau of Investigation (FBI) temporarily confiscated the executive's computer and cell phone. Yesterday, Monroy Gonzague's husband, Ramón López de Azúa, confirmed that federal authorities searched their house in August 2018, but denied that his wife were involved in projects or initiatives of the Department of Education. "Yes, they searched my house. That was in August. It wasn't against anyone. They came for a phone and the computer. We fully and openly cooperated with the officers and, then we were unofficially told that they raided another residence because here they did not find the information they were looking for," said López de Azúa, who until the previous administration headed the Federal Affairs Office of the Department of Education and is linked to the Popular Democratic Party and the island´s Democratic Party. "The search warrant was completely sealed. It didn't say what it was about or what it was for. They took the computer and the phone and returned them the same day or the day after. We made ourselves available so that they would have us ready to cooperate any time the needed us.... We haven’t been called again or anything. It's been eight months since then," he said. Federal authorities are investigating former Education Secretary Julia Keleher for alleged irregularities in the awarding of contracts in the agency she headed until last Tuesday. "Keleher must have stepped on someone’s toes and that might have caused a brutal war against her," he said, justifying the offensive against the now former secretary. López de Azúa said he met Keleher when she worked at the federal Department of Education. They worked together on the agreement signed in 2007, that enabled Puerto Rico to comply again with federal public administration standards, after Víctor Fajardo corruption scandal. Fajardo was the Secretary of Education during the administration of Pedro Rosselló González, father of the current governor, Ricardo Rosselló Nevares. "Since then, when Julia (Keleher) came into the department, at the federal level, we have had very positive work dynamics," López de Azúa said. Monroy Gonzague was also part of that process, as a consultant for the Department of Education. 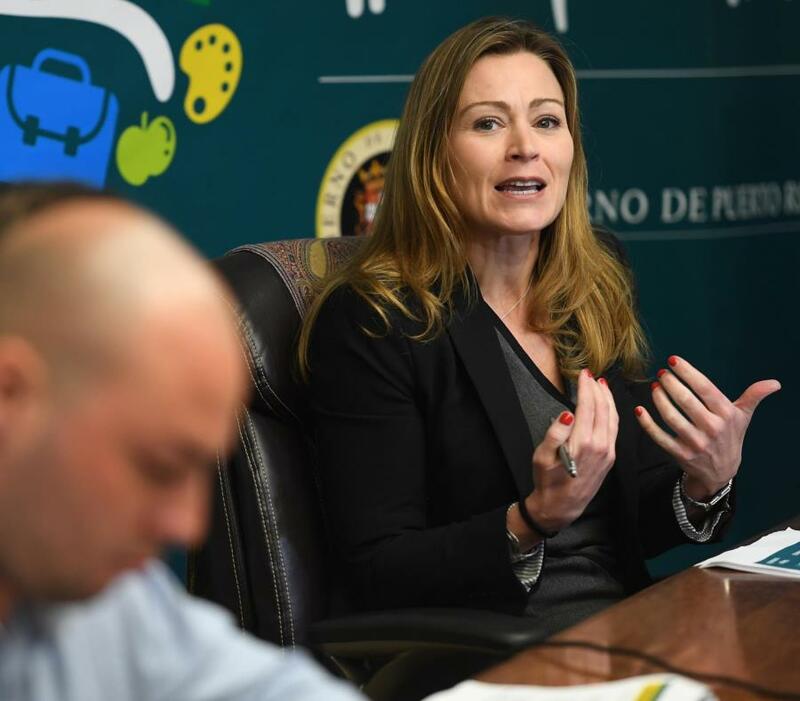 López de Azúa said that when Governor Rosselló Nevares offered Keleher the position of Secretary of Education, she transferred her shares in the company to Monroy Gonzague. So, Keleher & Associates' clients would continue to receive consulting services, and Keleher could lead the Education Department without major setbacks. He said the company had no contracts with any government entity in Puerto Rico while Keleher was the head of the Education Department. And he insisted that the company only provided services to entities in the mainland while his wife was running it. "They continue with the few contracts they had, there are even fewer contracts now. All (the clients) are outside of Puerto Rico. It has nothing to do with Puerto Rico, whether the public or private sectors. The company has really shrunk and my wife has not benefited from Julia being Secretary. That's an important point," López de Azúa insisted. "Another issue is that we have nothing to do with the Puerto Rico Education Foundation. Neither she (Monroy Gonzague) nor I. I personally haven't seen or talked to Julia since 2016 and I haven't stepped foot in the Department in five years and I don't work with anything related to education in Puerto Rico. They identify me as Popular and if they saw me talking to her, it would have made things more complicated than they already were," he added. The Puerto Rico Education Foundation is an entity that seeks donations mainly in the U.S. to contribute to education in Puerto Rico. According to López de Azúa, Keleher & Associates - while still being headed by the former Secretary of Education - developed initiatives with the law firm Hogan, Marren Babbo & Rose, but ruled out that such a link currently exists. Ties with this law firm raised controversy, after it was revealed that, in 2017, the Education Department hired the law firm where the governor's brother, Jay Rosselló, works. In fact, on the firms website, Jay Rosselló is the contact person to consult on issues associated with the Puerto Rico charter school program, an initiative that the governor has promoted from his office at La Fortaleza. López de Azúa said he does not know what information authorities might have had to search his home. He noted they only took care of Keleher´s dog when she was away, which they picked up at the agency and then took with them. Keleher has refused to comment on the matter. On Friday, she participated at a Yale University educational leadership conference, and members of the public asked her about this situation but she did not comment on the investigation against her.